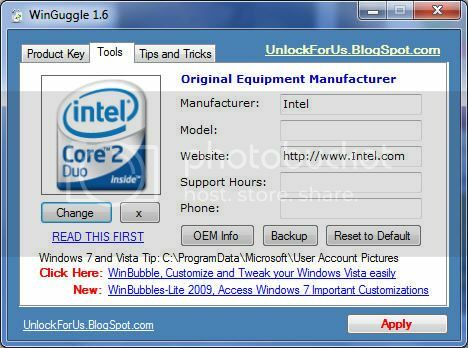 If you’re using Windows 7 and you’re curious to have a sneak into the details of your computers OEM then you can do so using a small utility known as WinGuggle. Well, OEM Info is displayed in the Control Panel in the System-Information window but if you use this tool you can edit Windows 7 OEM information. You can also edit different aspects of OEM information such as OEM manufacturer, Logo, model, website, etc. You can also view Windows 7 and Microsoft Office product key. The software is pretty small in size, just 146kb in size. It also works on XP and Vista.